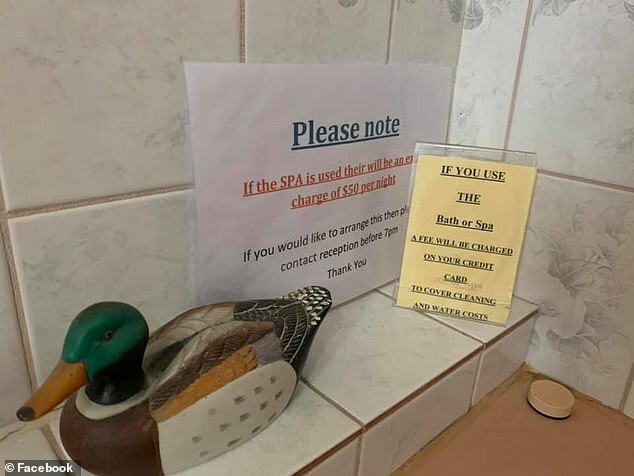 Australian travellers have revealed some of the most bizarre services they’ve been charged for when staying at hotels. Taking to a Facebook page dedicated to frequent flyers, one person started the thread with a photo of a sign that advised guests of extra charges for the use of the spa. ‘I had to stay somewhere rural for work, and found this sign next to the bath,’ the amused man wrote next to the snap. 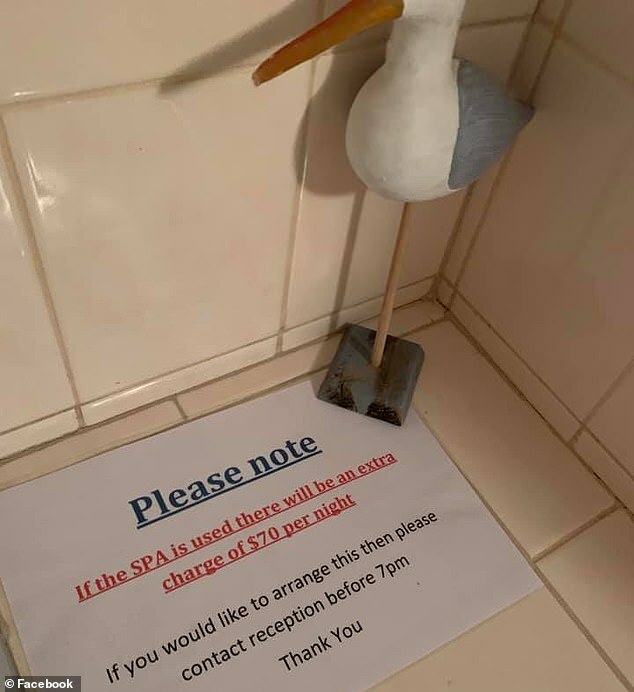 ‘Please note: If the SPA is used there will be an extra charge of $70 per night,’ the sign read. They’d taken the remote control for the RC Aircon and wanted $5 a night if we wanted to use it . Lachlan also shared a second photo showing details of a similar sign placed in a colleague’s room. Next to this sign was a notice explaining that the charge was to cover extra cleaning and water costs. ‘My colleague’s was only $50. And look at that duck!’ He wrote alongside the photo. Others were quick to join the thread, with one man revealing how he’d stayed in a place where the owners had labelled everything with instructions. Another explained how he’d rented a home in the Gold Coast one Christmas and after agreeing to pay peak rates was met by a total of 17 signs advising reasons for ‘Loss of Bond’. ‘These were the penalty for a whole series of transgressions such as “not putting the bins out on the kerb on Tuesday night”,’ he said. A third said she just ‘hated passive aggressive signs in hotels’ before revealing how she’d stayed at a hotel saying she’d be hit with a massive charge should a smoke alarm be triggered. ‘I stayed at a Mantra once that had red bold underlined words next to the stove saying if the smoke alarm goes off then there would be a $5,000 charge. ‘Why bother having the stove?’ She wrote.